Here's a cute one. A website, Wordle.com, exists solely to allow you to build "word clouds" in which the non-trivial words in a block of text are displayed with the most-frequently used words appearing larger than the less-frequently used words. The above, for example, is the Wordle version of my posting on the last Cub Scout camping trip I made with my grandson, Zach. The site also states that what you create is yours—you can make T-shirts of it, or put it on your website or book cover or what-have-you. 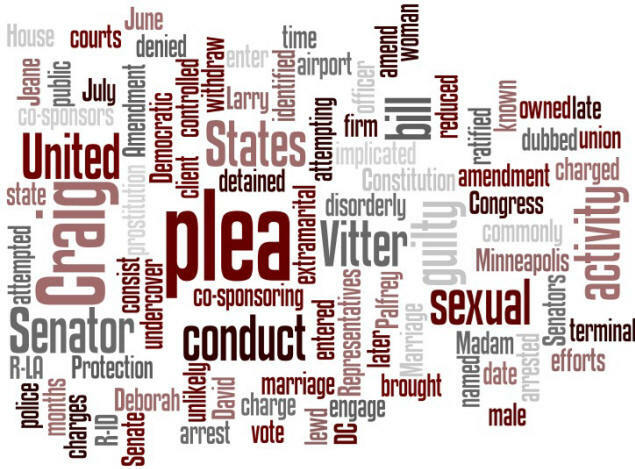 I took a rather humorous article about the two Republican Senators, toe-tapping Larry Craig and DC Madam client David "Where Is My Diaper" Vitter, who are the co-sponsors of a proposed, new federal "Marriage Protection Amendment", and made a Wordle of it. I think it's kind of interesting the way a word cloud brings the essence of a news story forward in a way the actual text of the story often fails to do. 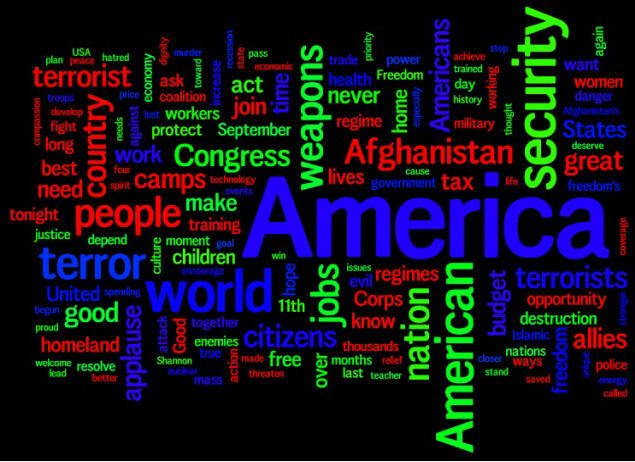 As a final example, here is a Wordle of President George W. Bush's most recent State of the Union speech, given on January 28, 2008. Remember, that a word cloud doesn't reveal any hidden truth. It just exposes the agenda of the speaker (or article) by emphasizing graphically which words were repeated over and over. 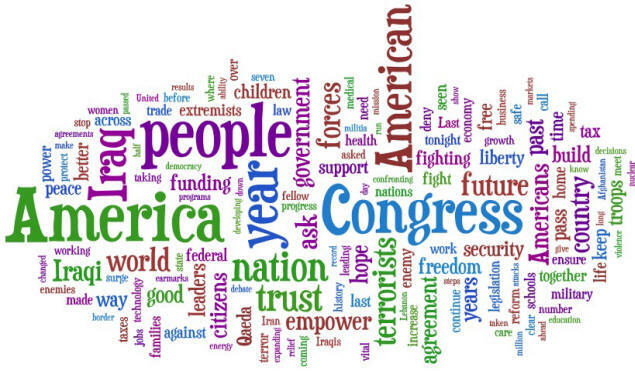 In this speech to the nation's Congress, the President covered a number of different topics; yet his emphasis was on feel-good words like "future" and "people" and, of course, "America" and "American". Interestingly, the word "extremist" was used more often than "women"; and "Iraq" more often than "American". I think we should make Wordles of all speeches from now on. In fact, you could make a point of publishing the Wordle instead of the actual speech. But that's just a thought.